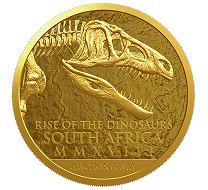 November 15, 2018 – The South African Mint, a subsidiary of the South African Reserve Bank, has unveiled a stunning five-coin Palaeontology Collection in 24 carat gold. The collection brings to life the ‘Archosauria’ – crocodiles, pterosaurs, dinosaurs and birds or the ruling reptiles that roamed and soared freely in Southern Africa some 200 million years ago. The rise of the archosaurs and their evolution is a significant event in the history of life on land, since they not only led to the evolution of dinosaurs and birds, but also to the pterosaurs (flying reptiles) and crocodiles. Archosaurs are regarded as the direct ancestors of the dinosaurs and the fossil records from the Karoo Supergroup’s rocks hold the key to understanding their early evolutionary history. 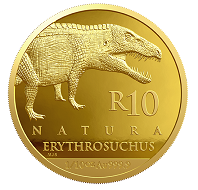 All South African coins from the “Archosauria” series share a common obverse which depicts the fossilised skull, neck and shoulder of an Erythrosuchus africanus. Besides the Karoo, many discoveries have been made on the continent and in the country along the borders of KwaZulu-Natal, Free State, Eastern Cape, Western Cape and the Northern Cape. These finds have helped fill in critical gaps in the evolution of dinosaurs and provide fresh information on how southern continents of Africa, South America and India separated. The presence of these fossil records endorses the theory that the South African portion of what was the prehistoric supercontinent Gondwana, was an evolutionary hotspot 260 million years ago. It reinforces the idea that the distant ancestors of mammals actually came from South Africa. The five coins in the 2018 Natura series, aptly named “Rise of the Dinosaurs” will be available in 1oz with a face value of R100 as well as in fractionals – 1/2 oz with a face value of R50, 1/4 oz with a face value of R20, 1/10 oz with a face value of R10 and 1/20 oz with a face value of R5, with each depicting a different archosaur, all in limited mintages. South African / 100 rand / gold .9999 / 31.104 g / 32.69 mm / Mintage: 1000. 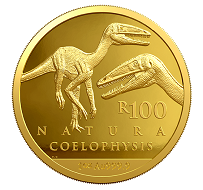 The 1oz R100 coin with a limited mintage of 1000 features the Coelophysids which were highly successful primitive theropod dinosaurs that lived on numerous continents from the late Triassic to early Jurassic periods. The small, agile bipedal dinosaur preyed on small animals and inhabited South Africa and Zimbabwe during the early part of the Jurassic period. About 165 million years ago, the group of small, feathered dinosaurs that we call birds today evolved from within the theropod radiation. South African / 50 rand / gold .9999 / 15.552g / 27.0mm / Mintage: 1000. 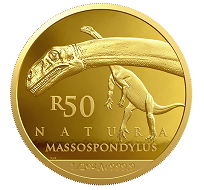 Depicted on the 1/2 oz R50 coin is SA’s most famous find, the Massospondylus carinatus, one of the most recognised dinosaurs in the world. Massospondylus is a prosauropod dinosaur that lived in the early Jurassic period, which makes it one of the oldest dinosaurs on earth. Only 1000 coins of these will be minted. Scientists have uncovered clutches of fossilised Massospondylus eggs at the site in Clarens bordering Lesotho and also found footprints of hatchlings showing that young dinosaurs stayed in the nest long enough to double in size. These nesting grounds are 100 million years older than any found before. South African / 20 rand / gold .9999 / 7.776g / 22.0mm / Mintage: 1500. 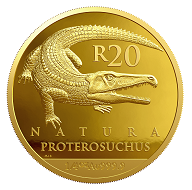 The Proterosuchidae, similar in form to the crocodile, features on the 1/4 oz R20 coin. The elongated snout of this creature resembles that of a crocodile or alligator which would suggest that it was a specialised fish-eater. Only 1500 coins of these will be minted. South African / 10 rand / gold .9999 / 3.110g / 16.5mm / Mintage: 1500. Erythrosuchidae were Archosauriforms from the late Triassic of South Africa and Namibia. The Erythrosuchus africanus was approximately 5 m long and stood over 2 m tall, making it the largest predator of the time. The Erythrosuchus had an exceptionally large skull for its size, occupying approximately a fifth of its total body length. This creature walked on all fours with a semi-erect gait which would have enabled it to move more swiftly than other more primitive reptiles of the same size They feature on the 1/20 oz R10 coin and only 1500 will be minted. South African / 5 rand / gold .9999 / 1,555g / 12.0mm / Mintage: 1500. 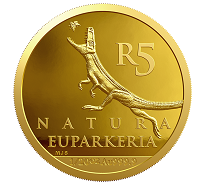 Depicted on the 1/20oz R5 coin is the Euparkeria capensis, a reptile which lived approximately 235 million years ago during the Middle Triassic Period. It was first discovered at the beginning of the 20th century in South Africa. Euparkeria was one of the first bipedal vertebrates with their legs longer than their arms, which suggest that they could move around quadropedally. Only 1500 coins will be made available. Noted palaeontologist and zoologist Dr Francois Durand from the University of Johannesburg contributed to the design of the coins and it’s his dinosaur renderings that appear on all the coins in the series. “Given the limited mintage, the Rise of the Dinosaurs is an exceptional, once-in-a-lifetime acquisition for Afrophiles and those who wish to travel some 200 million years back in time. The coins chronological timeline from the early Jurassic period to late Triassic periods gives the collection continuity and should pique the interest of avid collectors,” says Tsehlo in conclusion. For more information on these coins please visit the South African Mint website. DawnDinos offers additional information on the Euparkeria capensis. UC Berkeley has more to say about Proterosuchidae. In our archive, we have made all of the content available which has been published since CoinsWeekly was established.